Hockey Book Reviews.com: He Shoots . . . He Skewers! He Shoots . . . He Skewers! 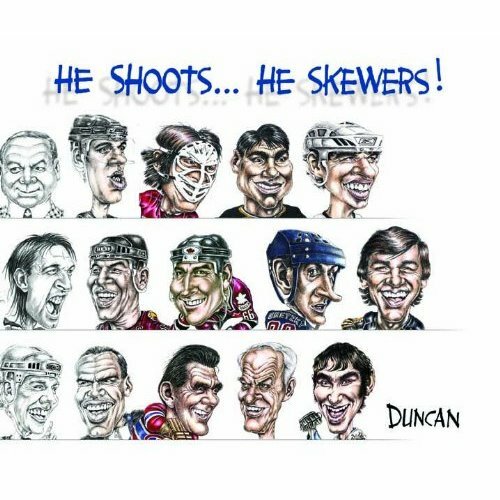 I am in Vancouver for the weekend and I just learned of a whole new hockey book I never even knew about before: He Shoots... He Skewers! by Roger Duncan. It is a fascinating look at many years of hockey as told through the caricature pen of Duncan, who has had his cartoons featured in newspapers across Canada. Do you remember playing hockey in your backyard as a kid, dreaming of fame and fortune as you fished your wayward shot out of a snowbank? This book caricaturizes the guys who didn't miss ... at least not very often! Past meets present as today's superstars and legends of yore are immortalized in the funniest, weirdest and sometimes most absurd moments in the game we all love. See what Don Cherry would look like as a masked crusader, defending the NHL from dastardly Russian defectors. Find out what Alexander Ovechkin has in common with Paris Hilton. Learn the real reason Sidney Crosby didn't shake hands with the Red Wings captain after the 2009 Stanley Cup final. Discover Vladislav Tretiak's goaltending secret during the 1972 Summit Series. Relive the media battle between Patrick Roy and Jeremy Roenick during the 1996 Stanley Cup playoffs. Find out what would happen if the Sutters met the Staals around a poker table. If a picture is worth a thousand words, some of the words in these caricatures might very well draw an unsportsmanlike penalty! Summit Studios also offers free full colour samples of Duncan's work.